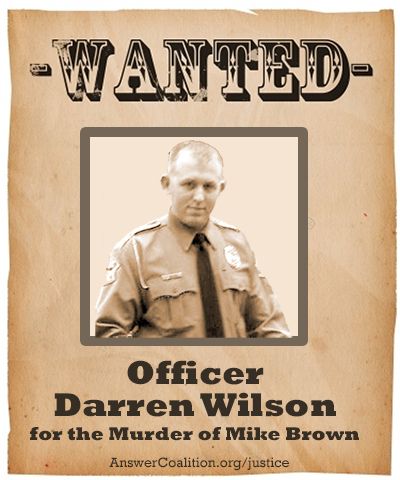 Click here to send an email demanding the indictment and prosecution of police officer Darren Wilson, who executed Michael Brown. Volley after volley of rubber bullets and tear gas canisters were fired by police forces, who used the latest technologies and armored vehicles in an effort to crush those who were protesting the cold-blooded murder of Michael Brown, an unarmed Black teenager who was shot six times, including twice in the head. ANSWER activists Ana Santoya and Arthur Sangster were arrested with others who were corralled by the police during last night's assault. The arrests happened during a peaceful march. Gloria La Riva, a longtime leader of ANSWER, was shot with a rubber bullet. She had been videotaping the events of the past days. Gloria, Ana and Arthur were joined in Ferguson by John Beacham, the Midwest organizer of ANSWER and Jamier Sale. Send an email right now demanding the indictment and prosecution of police officer Darren Wilson, who executed Michael Brown. A police badge is not a license to kill African-American young people. Join this movement for justice. 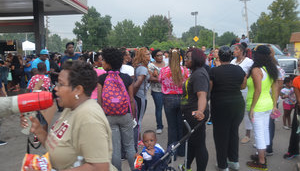 In addition to showing support in Ferguson for the besieged African-American community in this small town near St. Louis, people having organized protests in more than 100 cities demanding the indictment and jailing of the killer cop who took Michael Brown's life. 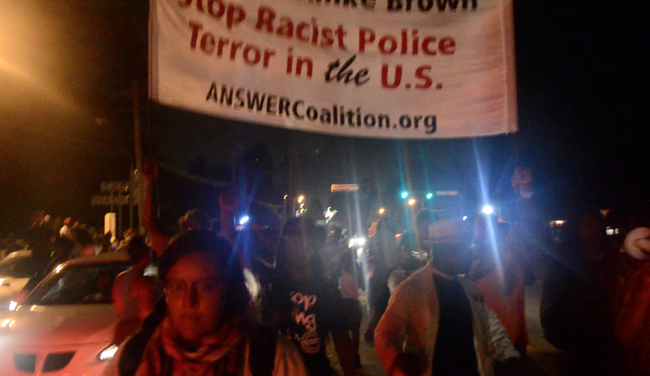 ANSWER stands for Act Now to Stop War & End Racism. Since ANSWER was formed on September 14, 2001, we have made the connection between imperial wars and racism. In Ferguson we are witnessing the use by increasingly militarized domestic police forces of war technologies that were employed against the occupied people of Iraq. The tanks, armored vehicles, night goggles and anti-human crowd control technologies that were employed in Iraq have literally migrated to Ferguson, Mo., and other U.S. cities as the Pentagon keeps sending its battlefield equipment to U.S. police forces for use against “occupied” Black and Latino communities at home. Read two eyewitness accounts from Gloria La Riva published yesterday (August 17) and today (August 18). 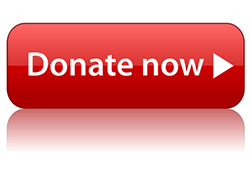 Please make an urgently needed donation to help the ANSWER Coalition continue its nationwide campaign to mobilize public opinion against war, occupation, racism and injustice from Ferguson, Mo., to Gaza. We can do this work with you, but not without you.